Happy Chinese New Year and Welcome to the Year of the Dragon! 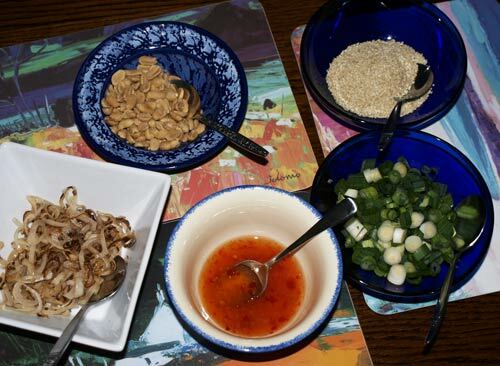 We celebrated Chinese New Year with another recipe from February's Delicious Magazine, San choi bao or prawn, mushroom and vegetable wraps, and I served it with the suggested garnishes of spring onions, fried shallots, toasted sesame seeds and peanuts. 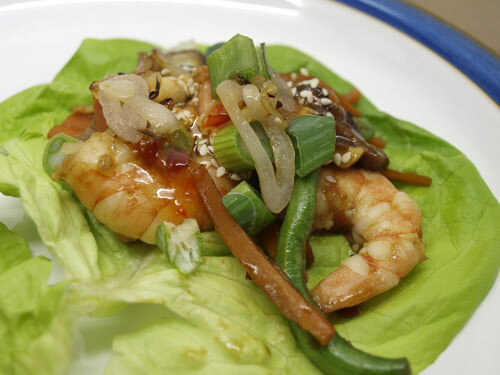 You are supposed to use the lettuce leaves as sort of wraps but they tended to fall apart. The recipe suggested 'round' lettuce but I think it might work better with iceberg letter which might hold together better with the warm food. Dragon – 龍 / 龙 (辰) (Yang, 1st Trine, Fixed Element Wood): Magnanimous, stately, vigorous, strong, self-assured, proud, noble, direct, dignified, eccentric, intellectual, fiery, passionate, decisive, pioneering, artistic, generous, loyal. Can be tactless, arrogant, imperious, tyrannical, demanding, intolerant, dogmatic, violent, impetuous, brash. wishing you & yours a very happy new year..
Oh Asian... my favorite cuisine! Looks delicious! looks good! I love the idea of a veggie wrap! recently posted on dumplings with a cabbage wrapper instead of wonton/dumpling skins for cny, and this kind of reminded me of it! so yummy, and perfect for the new year!! gong xi fa cai! Kung Hey Fat choi to you too Janice and pass a plate of that please! Looks fabulous!